In order to calculate the weight of steel plate, one must know the steel plate thickness and the steel plate density or steel plate specific weight, normally expressed in pounds per cubic foot (lbs/ft3). The calculation of steel plate weight is essential to estimating the steel plate prices. The carbon steel density is 489.6 pounds per cubic foot while steel thickness is expressed in inches. In order to correctly calculate the steel plate weight the unit must be the same. The approach is either to change the thickness to feet and multiply the result by the density to get a unit weight per square foot or change the density to inches and multiply by the thickness to get unit weight per square inch. In either case the answer should be the same. For instance to calculate the weight of ¼ inch thick steel plate, we need to convert the inches to feet. Since there are 12 inches in a foot, we divide the ¼ inches or .25 by 12 yield .0208 feet and multiply by the 489.6 pounds per cubic foot yields 10.2 pounds per square foot. To go in the other direction we need to covert the density to inches first by taking the 489.6 pounds per cubic feet and divide it by 12 cubic inches or multiply 12 by itself 3 times yield 1728. The result of 489.6/1728 is .2833 pounds per cubic inches. So the unit weight per square inch is .2833x.25 = .0708 lbs/si. By multiplying the .0708 by 144 converting square inches to square feet, we get 10.2 lbs/sf. 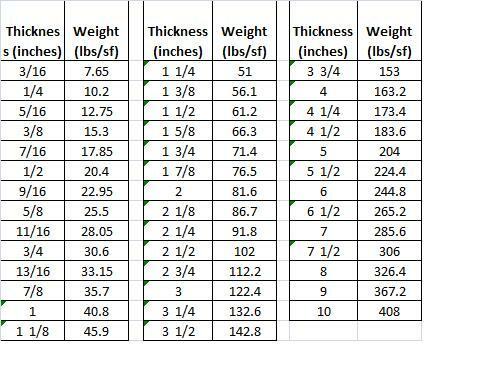 Refer to the table above for list of typical plate thickness with its associated weight. These were calculated using the method described above. The above calculation is very important in estimating the cost of steel plate because the steel plate prices are determined by weight when buying from steel mill or warehouses. This is how steel fabricators estimate cost of steel.